Steven R. Music kept a secret for decades. His secret was that he had died (due to a severe medication allergy) and seen Heaven. Everyone around him knew that he had spent weeks in a coma and that he came out of that coma a profoundly disabled person. Before he died, he was a SEAL candidate, bound for Annapolis. Afterwards, he was honorably discharged from the Navy on medical grounds. He spent a decade with severe respiratory disease before he was miraculously healed. Even then, he only told a few people about his spiritual journey to the other side of the veil. I’ve read several books on NDE’s (near death experiences) and they all have many things in common. Musick’s account of going to Heaven is similar to the others in several ways. What’s different about this book, however, is that the last third of the book focuses on how Musick’s NDE changed him, and how we all can be more sensitive to the “Heaven bubbles” (Musick’s term) that happen in our lives. Heaven bubbles happen when the veil that obscures our earthly lives from the spiritual realities around us becomes thin. I’ve come to believe that Heaven is closer than we think, and this book is a testimony to that assertion. I particularly love the stories that Musick shares about his Heaven bubbles…times when his spiritual eyes were opened and he was able to see a dimension beyond what we can see with our physical eyes. I really liked this book and recommend it to anyone who wants to feel encouraged about the fact that there are angels in our midst, and that there is more to this life than what we can detect with our physical senses. * I was given an unpublished proof copy of this book by the publisher in exchange for my honest review. The book will be released on March 7,2017. It is available for preorder on Amazon.com. Suffering. Most of us shy away from the word, let alone the reality. Our modern world is obsessed with avoiding suffering. The evidence is everywhere…from the commercials for prescription medications, to pain relief gadgets and gizmos, to the prescription drug addiction epidemic…the message is ubiquitous and unanimous: we deserve a life free from suffering! Enter real life. Suffering, whether physical or emotional, is part of this human experience. We all will suffer at some point in this life. I know a bit about suffering. I’ve struggled with the emotional pain of depression most of my life. I know the pain of divorce. I’m the mother of children with disabilities. At the height of my (beloved) career, I was diagnosed with a progressive neuromuscular disease. Now I’m confined to a wheelchair. I was given the chance to get a complementary copy of the Beyond Suffering Bible from Tyndale in exchange for a review and, I can honestly say, I wasn’t optimistic about this Bible being able to speak to my situation. Even though I know the Bible addresses suffering, I had no idea HOW MUCH it had to say. I really LOVE this Bible. 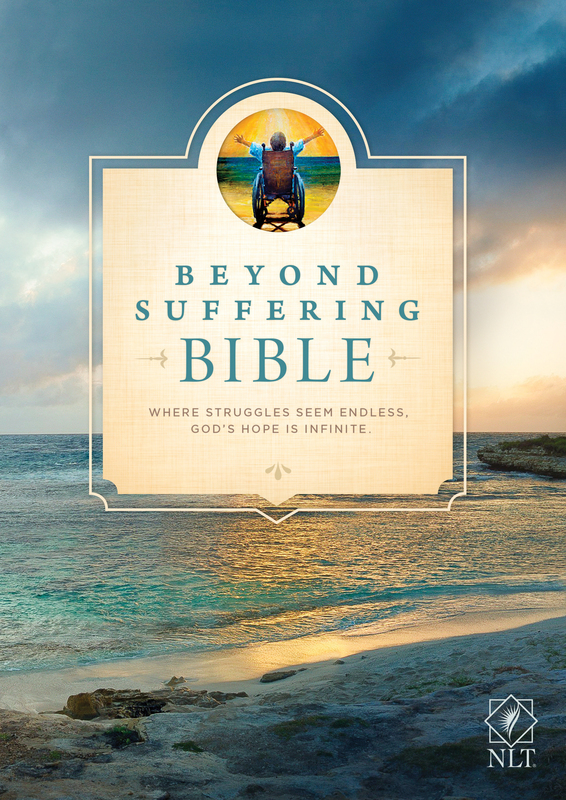 It is filled with insights into Biblical topics that relate to disabilities and suffering. “The Beyond Suffering Bible is for people who want to understand what it looks like to think and live like a Christian in the midst of suffering. This Bible is for caregivers, family members, ministers, and others who work with and serve alongside suffering and disabled people. These people will find insight, encouragement, and practical help for understanding what the Bible is saying to them about how to love, serve, and uplift the people God has placed in their lives. This Bibles is for the person with a disability or any suffering person. These people will find opportunities to engage with God, meeting him in the midst of their suffering, learning how to go about living beyond their suffering, and being transformed into a person who can be a bright light for Jesus just as they are. Joni Erickson Tada knows a thing or two about suffering. Click here to see a video Joni made about this Bible or go to beyondsufferingbible.com for more info! Kyle Morey takes a 30-day journey with God and brings us along! 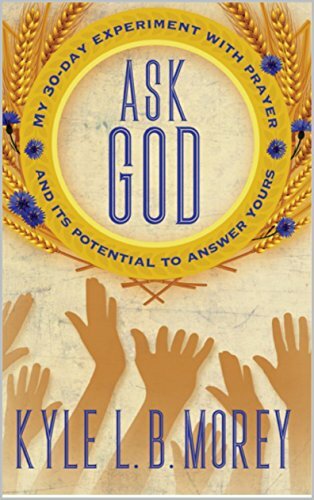 In his first book, Ask God: My 30-day Experiment with Prayer and Its Potential to Answer Yours, Kyle takes real-life stories and applies scriptural truth to weave a transparent, humble and honest story. He takes personal experiences and shares his own vulnerability all while being a diligent steward of the doctrinal truths he shares. Every day, after doing his “spiritual warmups (music, prayer and scripture study)”, Kyle asked God what message He had for the readers. He then faithfully wrote what he felt the Lord had for him to share each day. The stories Morey shares are drawn from his own life experiences as a member of The Church of Jesus Christ of Latter-day Saints, CEO, husband, and father of five. His insights resonated with me on many levels. We all face many challenges, and Kyle offers much life-changing insight into overcoming obstacles by turning to the Ultimate Source of Wisdom for guidance—always pointing us, the “dear readers”, to that Source. Why immersion in water? Can anyone baptize? What is the symbolism behind this ancient practice? Is your baptism legitimate? Is mine? What about my friends, ancestors and others who didn’t know about baptism—or Christ, for that matter? Are they doomed to know a lesser fate? These are all great questions, perhaps the most important questions you will ever ask—if you truly believe that baptism is vital to yours and the world’s redemption. Kyle Morey does an excellent job of giving us a glimpse into his life of devoted service to his fellow beings, and he doesn’t hide the fact that he isn’t perfect. I love the courage it took to write this book! Thank you, Kyle!